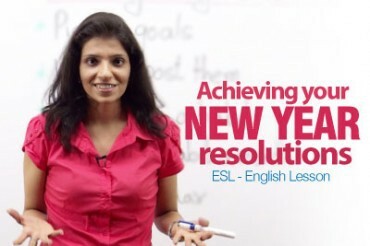 In this English lesson by Niharika you will learn English phrases with the word NO which are used in everyday English conversation. Practice these phrases to improve your English speaking skills. No Big Deal : Used to indicate that something is of little consequence. Eg: We have to pay a little extra for the tickets, it’s no big deal. Eg: I hope you don’t have any hard feelings after the meeting yesterday. Eg: He actually proposed to her in front of the entire office, no kidding! No offence : Generally accompanies a statement that could be regarded as insulting but is not meant to be. Eg: Excuse the comment last evening , no offence meant. Eg: I need to hit the gym regularly now, as they say , no pain no gain. Eg: Your first trip to London ? No wonder you’re so excited! 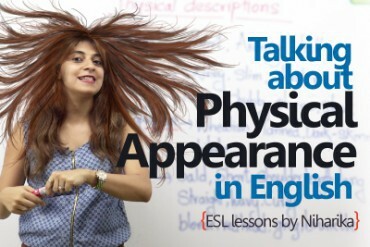 Talking about physical appearance in English. 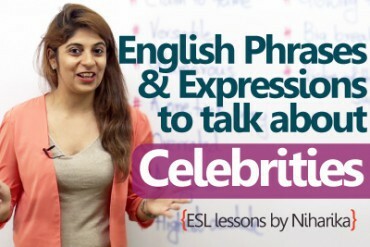 10 English phrases to talk about celebrities.